The spa experience was mediocre but it is always nice to spend the day in hot pools. The small hike to the waterfall was enjoyable and I got some great photos! Excellent trip and excellent value. Papallacta is well worth the the trip. Our tour guide Erica was very professional and friendly and full of interesting and informative commentary. 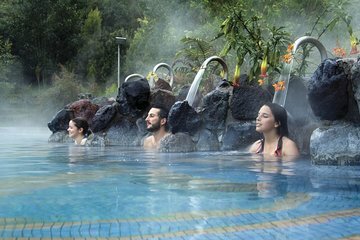 The hotsprings were very relaxing and the Spa itself was very clean and had a good menu to purchase food from a snack pack was provided at the beginning of the tour, and would have been enough to stay full. There are several pools at different temperatures nestled around some beautiful mountains with fantastic views. Truly a relaxation paradise with some additional spa options not covered by the tour if you are interested. The scenery and views were gorgeous on the way there and we got to see a lot of the countryside. The stop at the local mini-farm was interesting. I tried the best coffee I have ever had, and got to see and try some of the local food/crops grown on site. The people there were very warm and kind, and a little bit quirky. The views from the top of the building were great, and was definitely worthwhile. The only drawbacks was the meeting point was listed at a very busy and large intersection, and it took us a bit to find the actual tour stand. Our tour guide was friendly, but did not have the best English. We didn't really learn much about the local countryside and had a hard time understanding. It did not affect our enjoyment of the hotsprings and mini farm, but was enough to rate the trip a 4/5. A great way to start your vacation to melt away flight stress, or finish your vacation to rest sore muscles from seeing this beautiful country. Highly recommended. Great massage, drive, and Alex was a great tour leader!